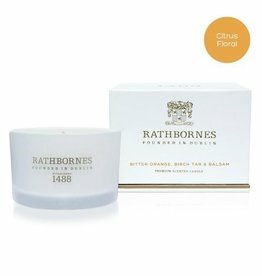 FOUNDED IN DUBLIN IN 1488, RATHBORNES IS THE WORLD'S OLDEST CANDLE COMPANY. ACROSS 500 YEARS RATHBORNES CANDLES HAVE ILLUMINATED THE STREETS, HOMES, LIGHTHOUSES AND CHURCHES OF IRELAND, AND THE CANDLES WHICH WE PRODUCE TODAY ARE STILL HAND-CRAFTED WITH MANY OF THE SAME SKILLED METHODS WHICH WE HAVE USED SINCE THE FIFTEENTH CENTURY. John G Rathborne established his candle company on Wynetavern Street, Dublin in 1488 after moving over from Chester, England to seek his fortune with an innovative new business. All of life's rituals were done by the soft glow of candlelight, and Rathborne's candles quickly became woven into the social fabric of the city. From the 1630s Rathbornes supplied Dublin with candlelight for its streets and lighthouses, creating a safer city for its residents and visiting merchants. Candles provided hope and safety from the storms which threatened sailors on the Dublin coastline. Today we no longer need candles to light our streets, but we choose them for our homes. The soft, wavering glow of candlelight provides the same comfort and romance as it has for centuries. Still based in Dublin, the Beyond the Pale collection celebrates our status as the world's oldest candle company and marks the culmination of centuries of innovation.